It took an outbreak, a mathematical model and a new law to get immunization rates up in California. Measles is a highly contagious and potentially deadly viral infection. Although the MMR vaccine that prevents it is quite effective, some children — including those with pre-existing health conditions, like cancer or compromised immune systems, and those who are younger than 6 months old — cannot receive it. These vulnerable populations rely on herd immunity to protect them. When vaccination levels reach a critical threshold — 83 percent to 94 percent for measles — the high concentration of immune people squelches the spread of the disease, preventing it from reaching large numbers of unprotected people. The trouble with getting vaccination rates to this critical threshold is that people lack scientific understanding, said University of Bristol professor Stephan Lewandowsky, who studies how prior beliefs influence the acceptance of scientific facts. The concepts of herd immunity and exponential growth are difficult for most people to grasp, Lewandowsky said. What people don’t intuit on their own is that an average person with the measles is likely to infect 12 to 18 others in an unvaccinated population, meaning that the number of measles cases increases more than tenfold with each fresh round of infection, so what starts as an isolated case can rapidly become a full-blown epidemic. Normally, herd immunity puts up roadblocks that keep each new case from being converted into others — if most people are immune, the disease fizzles out before encountering new potential hosts — but with something as contagious as measles, it doesn’t take many parents opting out of immunization before this critical protection mechanism becomes ineffective. When making the case for mandatory vaccination, simply presenting people with the facts may not convince them and could even backfire, Lewandowksy said. People tend to dig in deeper when presented with information that contradicts their worldview. To reverse people’s beliefs, it’s more helpful to provide an explanatory model, he said. That method helped in California. Pediatrician and state Sen. Richard Pan introduced Senate Bill 277 in 2015 and went looking for a way to explain the importance of mandatory vaccination. He stumbled across a model that depicts how an epidemic unfolds when herd immunity is lost. The model, a graphical outbreak simulator called FRED (Framework for Reconstructing Epidemiological Dynamics) Measles, was developed at the University of Pittsburgh’s Public Health Dynamics Laboratory, which is directed by Mark Roberts. FRED Measles demonstrates that if 20 percent of schoolchildren aren’t vaccinated, a single isolated case of measles can rapidly erupt into an epidemic. The FRED platform allowed researchers to build a simulation of human interaction dynamics, Roberts said, wherein virtual people in 116 million households across the country live, work and socialize according to data synthesized from the U.S. Census. The FRED Measles model can be used to visualize infectious disease dynamics in any county,2 so Pan could show his fellow senators exactly how an outbreak would play out in their own backyards. “There was something about showing a movie of your hometown that people relate to,” said Don Burke, dean of the school of public health at the University of Pittsburgh. It was his idea to break the model down by county. Lewandowsky said that making the simulation relevant to where you live taps into a well-established principle of cognitive psychology called “construal theory.” When a problem feels local, Lewandowsky said, people are more likely to be proactive. When former California state Sen. Marty Block first laid eyes on the bill, he said, he was concerned that making vaccination a prerequisite for attending public school would limit access to education. After watching a simulated outbreak unfold among his constituency, however, Block said his sense of duty to protect public health overwhelmed his other concerns. Opponents of California’s bill also predicted that if it became law, vaccination rates would remain the same while school enrollment would drop. But the opposite turned out to be true, Pan said. 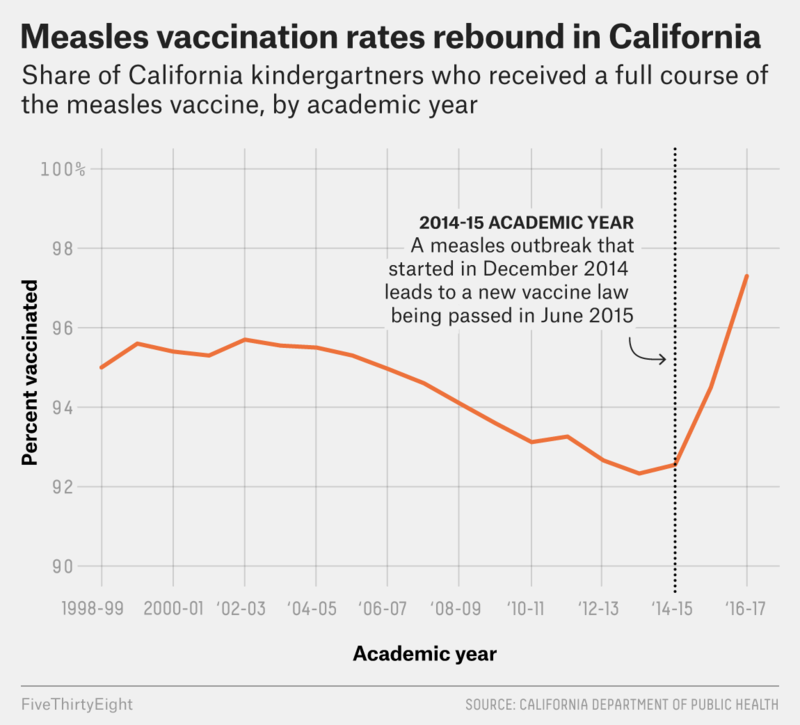 After the law went into effect in 2016, vaccination rates hit an all-time high — and school enrollment increased, according to the California Department of Public Health. The legislation appears to have changed behavior, and Lewandowsky said attitudes will likely follow suit. When a new law requires people to change the way they act, they tend to vociferously decry the change at first, but opposition often evaporates as years pass and the new behavior becomes the status quo. Lewandowsky said that attitudes toward bans on indoor smoking had followed this pattern, for example. But could the model convince lawmakers in other states? It’s hard to say. Most states still allow parents to exempt their children from vaccination for religious reasons, and more than a dozen of those — including Minnesota — also allow philosophical exemptions. Last year, Roberts reached out to 20 or 30 legislators in states trying to tighten vaccine exemption laws. He explained how FRED Measles could help proponents of these bills to make their case and even offered to travel to the legislators’ states to present the model in person. To his surprise, he didn’t gin up much interest. Pan said the onus for changing vaccination laws cannot be on legislators alone — grassroots organization among pro-vaccine parents is also essential. While 88 percent of U.S. adults believe that the benefits of vaccination outweigh the risks, they are generally not passionately outspoken about the belief, Pan said. FRED Measles could be useful to parent-led movements too — its original intent was to target the public, Burke said. To that end, he and his colleagues made the simulation available online and aimed to make it user-friendly and even smartphone compatible. Burke’s colleagues sent the link to Twitter-famous figures in hopes of reaching the widest possible audience. But Lewandowsky thinks the problem with public engagement on health policy is not that people don’t have access to information, but that 99 percent of people aren’t paying attention. CORRECTION (June 16, 2 p.m.): An earlier version of this article incorrectly said that 88 percent of U.S. parents think the benefits of vaccines outweigh the risk — it is 88 percent of all U.S. adults. CORRECTION (June 21, 11:45 a.m.): A previous version of this article misstated the role Mark Roberts played in developing FRED Measles. He directed the lab, not the project. It’s difficult to directly assign causation to any one factor, but while the initial increase could have been due to media coverage of the Disneyland outbreak, the legislation almost certainly contributed to the continued gains. The online version omits some counties where population density is lower, but the model could work on any county.